Half Marathon Training Starts Next Week!!! The West Lafayette Parks & Recreation Dept. half marathon training program officially starts next week. Be sure to sign up today. If you want to learn more before you sign up or if you've already signed up, be sure to attend one of the programs information meetings. Both are set for Morton Community Center, room 106. The first meeting is today, Wednesday, June 24th at 7pm. The second meeting will be on Saturday, June 27th at 8am. We will cover the program itself and what you will need to get started. Attendance at the meetings is encouraged but not required. What is required is program registration; which can be handled in-person at either of the information meetings or at the Parks & Rec office on Kalberer Road or by calling the Parks & Rec office at 765-775-5110. And, attend only one of the meetings. On Oct. 19, the Purdue Boilermaker Half Marathon — along with the 5K — will return for its second year. And runners can expect fewer hills and more of campus. Heather Ladd, who oversees race registration, said the course will still include downtown Lafayette near the Tippecanoe County Courthouse, but has more of West Lafayette and the Purdue campus for runners to enjoy. Ladd said this year’s race will be bigger than in 2012. “We’re expecting 4,000 runners this year which would be up about 1,200 from last year,” she said. And at 13.1 miles, a half marathon is a race that many people can do, including people who don’t consider themselves runners, said Mark Acher, a runner and local running coach. Although October is still months away, local training programs will start soon, giving runners 12 weeks to prepare. “It’s a good amount of time to take a beginner and give them a base to compete,” Acher said. Participants will receive a weekly schedule. There will be programs about running-related topics on Saturdays. Coaches also will be available to answer questions and offer advice. When & where: Starts at 7 p.m. July 30 at Fleet Feet Sports West Lafayette, 500 Sagamore Parkway West. Training sessions are 7 p.m. Tuesdays and 8 a.m. Saturdays at the same location. How to register: Go online to www.fleetfeetsports.com or visit the store in person. Then attend an optional orientation at 7 p.m. Thursday at Fleet Feet Sports. Participants will receive emails with workout plans, informational sessions about running-related topics and have running coaches to answer questions. When & where: Starts the week of July 28, group runs are Saturday mornings and will be throughout West Lafayette. There also will be track workouts during the week. How to register: Register at Tri-N-Run, 13 N. Earl Ave., Lafayette, or www.signmeup.com/92512. A partnership with Acher of Performance Running LLC, the program includes emails for participants with weekly training plans as well as Acher answering questions in a group setting. When & where: Starts July 29. At 7 a.m. on Saturdays, there will be weekly group runs throughout West Lafayette. How to register: Complete a parks and recreation activity registration form. To find the form go to www.westlafayette.in.gov or to the Parks and Recreation office, 1101 Kalberer Road, West Lafayette, or register by calling 765-775-5110. Then attend an optional informational session at 7 p.m. Wednesday or 8 a.m. Saturday in Room 106 at Morton Community Center, 222 N Chauncey Ave, West Lafayette. 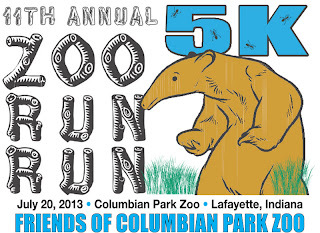 Good Luck to everyone running tomorrow's Zoo Run Run!! 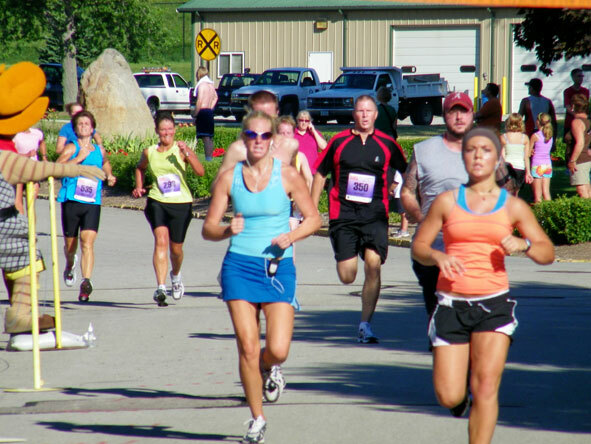 Yesterday's FM5K was certainly one of the hottest runs of the year. The temperature at start time was 91 degrees and with the dew point factored in, it felt like 99 degrees! With such conditions you'd think that there'd be paltry turnout. Tell that to the 82 runners that turned out! What a great showing, bolstered by Lafayette Jefferson HS Cross Country Coach and proud WRRC Member Dave Howell and 18 of his team members. A big thanks, as usual, to Travis Butts and his TNR Race Management llc team for support of the event and nailing down the timing and scoring. Thursday, July 11th is the day!!! Several people have asked about our hours -- We are open Weekdays 7am-noon and 4-8 pm, Saturdays 7am-noon, closed Sundays. 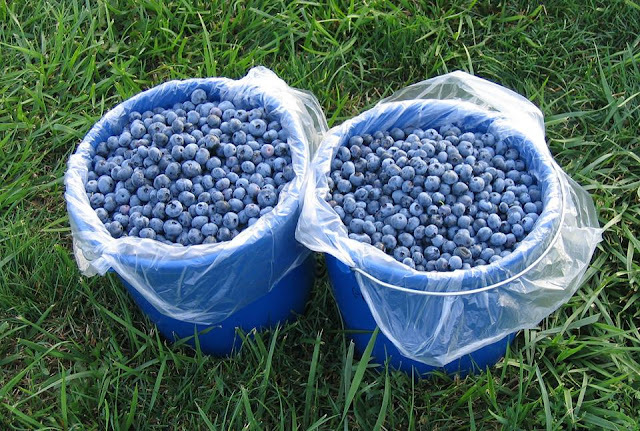 Visit our webpage for more info about our farm -- www.PrelockBlueberryFarm.com. Self-picked blueberries ready on Thursday. Save me some if I can't get there till 7:30am! For having a heavy downpour about an hour before start time, there was a good turn out for the Wabash River Runner Club's Trail Run 8K. Thanks go to Fleet Feet and The Franklin Finish. Hope to everyone at the Trail Run 12K on July 31st.